The one-day bonanza for residents ended on Wednesday as they will again have to pay the hiked rates for parking from Thursday. The MC had reduced the parking rates by half after cancelling the contract of the parking firm due to its failure to deposit the licence fee. 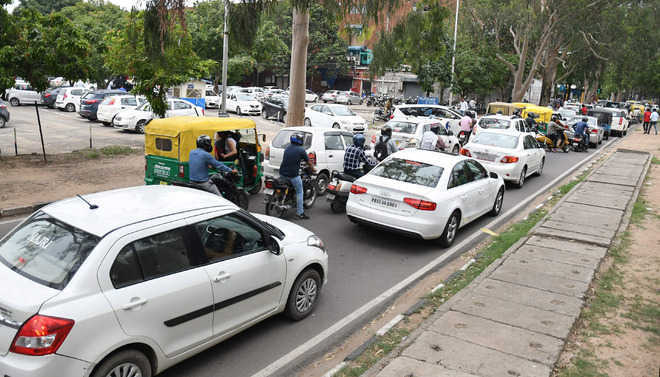 However, the residents will now once again be charged Rs 10 for two-wheelers and Rs 20 for four-wheelers for four hours, which will be increased on an hourly basis. The parking firm, Arya Toll Infra Limited, will take over the charge of all 25 paid parking lots on Thursday after the Punjab and Haryana High Court on Wednesday suspended the cancellation order issued by the MC. Sources said during the hearing, the company agreed to deposit Rs 1.35 crore immediately and offered to deposit the remaining amount of the licence fee in three instalments within 15 days. The firm deposited the first instalment of Rs 1.35 crore in the evening. MC Commissioner KK Yadav said the civic body received the first instalment of Rs 1.35 crore in the evening. He said the possession of the parking lots would be handed over to the firm after the MC received a representation along with a copy of the order from the parking firm. Sunil Badlani, an official of the parking firm, said they would take over the parking lots on Thursday after getting a copy of the order. He said the firm would charge the same rates as applicable before the cancellation order. The MC had cancelled the contract on July 9 after the firm failed to deposit the licence fee of Rs 3.69 crore for the fifth quarter and took over the charge of the parking lots. A day after, the F&CC of the MC decided to revert to the parking charges prevalent before March 31. Sunil Badlani, an official of the parking firm, alleged that the firm had suffered a loss as equipment installed at the parking lots had been broken. He said the firm would seek damages of over Rs 60 lakh from the MC. In its order, the HC said the possession of the parking lots would be handed over the firm forthwith in case it deposited Rs 1.35 crore in the bank amount of the MC. The facilities, as agreed upon in the contract, would be provided by the company within 24 hours of the restoration of the contract. The court also directed the firm to deposit the remaining amount through three post-dated cheques before July 26. In case of default, the MC’s July 9 order would come into force.